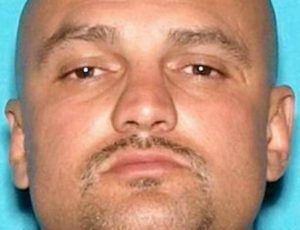 Frank Anthony Ramos, Jr., 41, is suspected of committing a robbery in King City, in addition to the Atascadero incident. He is also suspected of auto theft. Last Thursday, a man entered the Chevron station in the 8900 block of Montecito Avenue, brandished a large knife and stole alcohol, Atascadero police said. Officers from multiple law enforcement agencies encircled the area and searched for the suspect but failed to locate him. Following the incident, investigators discovered that, eight hours prior to the robbery, a similar incident occurred in King City. Law enforcement personnel from multiple agencies suspected the Ramos committed both robberies and that the man was driving a vehicle reported stolen in San Jose. On Tuesday, Atascadero investigators learned the stolen vehicle was located in Santa Barbara and the driver had been arrested. Atascadero police headed to Santa Barbara, where they searched the vehicle and found evidence associated with the Chevron robbery. Ramos is currently being held in Santa Barbara County Jail on charges of auto theft and a parole hold with plans to add a robbery charge.